"I messed up my legacy here." WASHINGTON -- On the day it was finally over -- last Saturday, when the coach talked about the future, the bleary-eyed general manager looked relieved and Gilbert Arenas left the city that once adored him without so much as saying goodbye -- the boy who escaped the fire stood in an empty Verizon Center hallway, around the corner from the locker room where everything went so wrong. There was Arenas' wood-paneled locker, empty, save some gym clothes and a pair of shoes. Its former occupant was on a flight to Orlando, Fla. There was Arenas' promise, undone by four handguns and a scribbled note that turned a once-rousing relationship into a loveless marriage between team and player, a curdled union now mercifully annulled. And here was Andre McAllister Jr., a Washington Wizards ball boy and house fire survivor, alongside his father, Andre Sr. Both of them happy and sad, together. Happy to be celebrating dad's birthday by watching the Wizards play the Miami Heat. Sad that Arenas wasn't there to join them. The Arenas years in Washington are finished. The John Wall era is underway. Agent Zero jerseys still dot the Verizon Center stands, but many fans and members of the Wizards organization seem eager to turn the page and to put Arenas' legacy -- his self-described mess -- behind them. The McAllisters are not among the good-riddance group. "Gil's a good dude," Andre Jr. says. "He's always been there for me." The McAllisters are thankful for Arenas' continued support. "Gil has been a blessing to us," Andre Sr. says. "And it's a blessing that continues. Not just right after the accident." The flames began in the basement. It was still dark sometime before 4 a.m. on Dec. 20, 2004. Almost Christmas. A space heater ignited a blanket. The handyman who lived downstairs -- a renter and a family friend -- awoke to heat and smoke. He attempted to extinguish the two-alarm fire, authorities said, and tried to wake the others. "Get out!" he yelled, fleeing when the heat became too much. Fanned by a frigid wind, the fire spread quickly through the McAllister home's wooden walls, reaching the roof. Upstairs were Andre Jr.'s great-grandfather, David; his mother, Joy; his older sister, Aisha; and his 5-year-old cousin, Daisha. Alerted by a smoke alarm, Joy hustled Andre Jr. out of the house. She went back in, authorities said, to rescue the others. Firefighters later followed, retreating from a stairwell when the floorboards began to buckle. The blaze exploded, a fire department spokesman said, "like a bomb." The roof and first floor collapsed. It took about an hour to put out the fire, which was D.C.'s deadliest since 1993. Firefighters found David outside on concrete steps leading to the basement. He had jumped from a second floor window. They found Joy and Aisha inside, embracing. They found Daisha hiding in a closet. A few hours earlier and across the country, Arenas hit a game-winning shot for the Wizards against his previous team, the Golden State Warriors. Fast becoming the face of the franchise -- and perhaps Washington 's favorite athlete -- Arenas would soon be named to his first NBA All-Star team. He was fun, scoring points with panache and ease, coining silly nicknames and tossing his sweat-soaked game jerseys to fans, right there on the court. His best seemed yet to come. On the road, Arenas read about the McAllister family. He was moved. When Arenas was 3 years old, his mother abandoned him. He was raised by his father, an aspiring actor and night-shift worker. Father and son were close. They played video games together. But Arenas spent much of his childhood alone, sneaking out in the dead of night to shoot baskets near his Southern California apartment. He understood loss and loneliness. Arenas invited Andre Jr. and his 10-year-old cousin to spend a day with him on Dec. 23. Two days after the fire. He brought them to Wizards practice. Andre loved basketball. He shot 3-pointers on the team's practice court. He got a tour of the locker room. According to the Washington Post, he told Wizards player Jarvis Hayes that Aisha had a bookmark with Hayes' picture on it. "My sister," he said, "thinks you're the cutest one on the team." "You go home and tell your sister she's all right," Hayes said. After practice, Arenas walked the boys from the arena to a movie theater next store. Alongside about 200 other children -- on hand for Arenas' Christmas Dream, an annual charity event -- they watched a SpongeBob SquarePants movie. Arenas gave everyone toys. He then took Andre and his cousin shopping and back to his house to watch movies and play video games. Later that evening, there was a knock on the door of Andre's grandmother's house, where relatives and family friends had gathered to grieve and cope. In came Andre, holding a shopping bag. Next came his cousin, also holding a bag. In came a young man, holding many more bags in both hands. Andre's grandmother put her hands to her mouth. She began to cry. The next morning -- Christmas Eve -- Andre's Uncle Ian and Aunt Dale woke him up. Excited. Screaming and crying, using Andre's family nickname, Arnie. "Arnie! He wants to adopt you!" "Gil wants you to be his little brother!" Andre was shocked. He figured he would never see Arenas again. Instead, he was invited back to the Verizon Center the next week. He met Arenas in the locker room. "What's up, little bro?" Arenas said. Andre grinned. The two hugged. They walked to the court, where Arenas introduced his teammates. Andre became a Wizards ball boy. Soon, he was spending his weekends next to the bench, watching his favorite players up close, eating extra-large press room ice cream sundaes during halftime. Andre didn't just feel he had a big brother in Arenas, he felt he had a whole locker room full of big brothers, from Antawn Jamison to DeShawn Stevenson. "It was a kid's dream," Andre recalled. At the time of the fire, Andre Sr. was incarcerated on a parole violation. It was his first Christmas away from his family. An 11-month sentence. He had two months to go when he was temporarily released to attend funeral services. He was back behind bars when he saw a television report about Arenas. "I was like, 'Wow, why is he doing this for my son?'" Andre Sr. said. "We never called him, never asked for anything. Gil just did it. It seemed so genuine." Dad, listen, I know he's not you, but he's helping me right now because you're not here with me. It helps me a lot to have someone. Now it was Andre Sr.'s turn to cry. In the early morning hours of Dec. 20, 2009, Arenas and teammate Javaris Crittenton argued over a card-playing debt during a team flight from Phoenix to Washington. Arenas threatened to shoot Crittenton in the face. Crittenton threatened to shoot Arenas in the knee. The next morning, Arenas placed four unloaded handguns in front of Crittenton's locker at the Verizon Center -- one of them a gold-plated Desert Eagle -- along with a handwritten note reading, "PICK 1." The incident went national. It became a punch line, a head-shaking news item and a symbolic cross for the myriad sins of the modern knucklehead athlete. The NBA suspended Arenas indefinitely. The Wizards took down a giant banner of him that hung across the street from the arena. Kick him out of the NBA! Make an example out of him! The letters were sent to Morin, 32 in all. They came from the founder of a local anti-youth violence group, from a former special assistant to the D.C. mayor and from a federal police officer who runs a Washington summer basketball league. They vouched for Arenas. They asked for leniency. Like the time Arenas saw that Hurricane Katrina refugees were being housed at the D.C. Armory, so he drove to Costco, loaded up his SUV with $18,000 of provisions and delivered the goods himself. Or the time he gave his entire playoff share to Wizards equipment manager Robert Suller, allowing Suller to buy a minivan to accommodate his special needs daughter, who suffers a rare genetic disorder and requires constant medical care. Or the time Arenas invited two young boys whose father had been murdered to a Wizards practice then arranged for them to sit on the end of the team's bench for all weekend home games, where the boys became fast friends with … Andre Jr.
"Gilbert had a major impact on my family's grieving process through acts of emotional support and thoughtfulness," wrote the boys' mother, Stacey Oxner Gail. "He has been a major part of them healing." Andre Jr. also wrote a letter from his Oxon Hill, Md., apartment, where he lives now with his father and stepmom, along with their infant son and daughter. Andre and Arenas never fell out of touch. They saw each other at Wizards games, where they held impromptu shooting contests. They hung out at Arenas' house in suburban Washington . When Andre turned 14, Arenas threw him a birthday party and sent a truck-style limo to collect the boy and five of his friends. Everyone, Arenas included, played video games: "Madden NFL," "NBA 2K," "Halo." As Andre got older, his conversations with Arenas changed. Arenas used to ask about school. Now he asks about girls. Every year around Christmas, Arenas takes Andre shopping. He always says the same thing: Get whatever you need. Whatever you want. On March 26, Arenas was sentenced to 30 days in a halfway house and two years of probation. Clad in a dark blue suit, he apologized for his actions. Morin scolded him for committing a "stupid and immature act." Arenas went home. His fiancé was with him. That evening, only three people came to visit. Sashia Jones, the Wizards' community relations director. "Everybody makes mistakes," Andre said. "That's how I looked at it. It hurt me. I wanted to support him. I wanted to help him as much as he helped me." Andre Sr. works as a city bus driver. This is his day off, he sits on a couch in his family's living room, holding a video game control pad, about to square off against a friend in virtual basketball. He selects the Orlando Magic. A pixilated Arenas appears on the screen. One corner of the room is overrun with baby toys. Another is dressed up with holiday decorations. Today is Dec. 20, the sixth anniversary of the fire. Even now, it's hard. Andre Sr. always wonders: What if I had been there? If I had been there, would I still be here now? "My son is happy I wasn't there," he says. Father and son share a tight bond. They play a lot of digital hoops. Sometimes, the boy comes to his dad. I miss mom and sis. They talk. "Since the tragedy, he matured overnight. He's not the average 16-year-old. He's hurt. But he wants be an example for others who go through things, to show you can always rebound. He has friends who have lost their mothers and fathers. He always says, 'I know how you feel.'" Andre Jr. comes home from school. He's a sophomore at Oxon Hill High, where he plays junior varsity basketball. Point guard. He talks about playing varsity next year, about playing in college. He says that if he doesn't earn an athletic scholarship, Arenas has promised to pay his tuition. He likes North Carolina A&T, Florida and Miami. "Oh, and Arizona," he says. "Where Gil played." Tacked to the wall of Andre Jr.'s bedroom is a T-shirt with a picture of his mother and sister. Forever in our hearts, it reads. 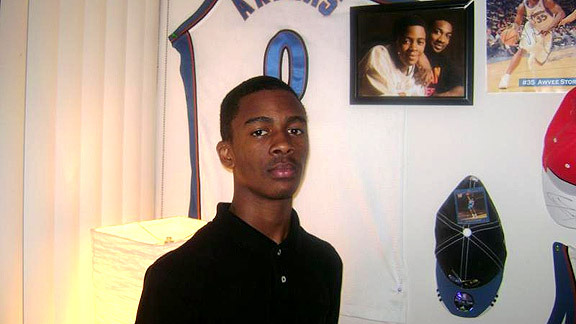 Also tacked to the wall is an Arenas jersey, next to a picture of Arenas and Andre Jr., Arenas resting his arm on the boy's shoulder. Neatly stacked in Andre's closet are at least 20 pairs of Arenas' old signature Adidas shoe, in every color imaginable. The shoes are too small. Andre has grown in the last year. "I need to donate them somewhere," he says. Three weeks ago, Arenas took Andre holiday shopping. They went to Macy's. Andre got a pair of jeans. That evening, as LeBron James made his much-hyped return to Cleveland , the two spent an hour at the Verizon Center , quietly shooting baskets. The next night, Washington defeated Portland at home. Andre hasn't seen Arenas since. "The roster they have now, I really don't know anybody," he says. "The Portland game, I introduced myself to John Wall. His father died when he was young. We talked about that." The day Arenas was traded, he told Jones, the community relations director, he wanted to speak with Andre. The two failed to connect. Andre isn't worried. He might visit Arenas in Orlando. He'll definitely see Arenas when the Magic visit Washington on Feb. 4. Besides, he said, Arenas is only a phone call away. Always will be. Just like a big brother. "I had a feeling he might get traded," Andre says. "But that doesn't matter." Andre's baby brother toddles into the room, fingers in his mouth and a yellow toy in hand. Curious and wide-eyed, he babbles in baby talk, clearly wanting to play. Andre scoops him up. Grinning, the boy who escaped the fire gives him a kiss. This, too, is Arenas' legacy.